"Adventure Island II (高橋名人の冒険島Ⅱ, Takahashi Meijin no Bōken Jima Tsū, lit. 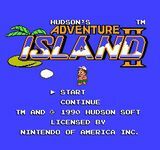 "Master Takahashi's Adventure Island II") is a video game made by Hudson Soft and first released in the United States in February, 1991. On April 26 of that year it was released in Japan, and a European release followed on July 22, 1992. The player assumes the role of Master Higgins, a tropical villager who is trying to save his girlfriend from the aliens that are invading places surrounding Adventure Island; he is aided by skateboards, dinosaurs, and axes. It is a classic side-scroller game." Source: Wikipedia, "Adventure_Island_II," available under the CC-BY-SA License.